We glad to introduce you the new 2nd Generation of Zeceen Metal Cable! More metal, more durable, more armored - everything more! Eliminate the frustration of dealing with inferior quality charging & sync cables which affect the performance of your premium Android and Windows Devices & your productivity - Get the best Micro USB Cable! We also offer you 100% risk-free satisfaction warranty to let you buy with confidence; no questions asked. Anything goes wrong, just contact us and we will either replace the cable or refund your full money. ORDER NOW & Get this Incredible Cable and Get rid of Charging & Data Transfer frustration once & for all! UNPARALLELED STRENGTH & LONG LIFE - Inferior quality charging and data sync cables not only raise the level of frustration by offering poor charging & transfer speeds but also start to fray or come apart just after a few days of uses. 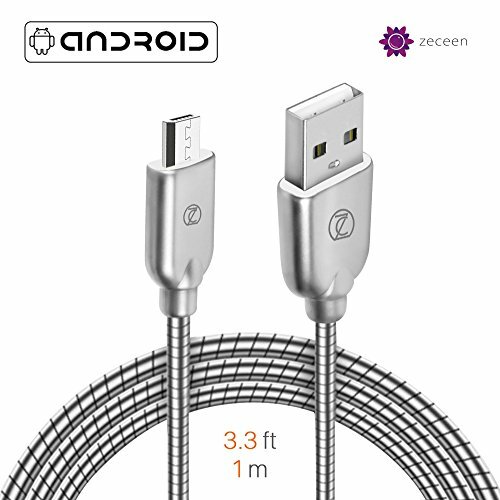 ZECEEN Metal Micro USB cable comes with a sturdy Zinc alloy Connector & a high-strength yet fully flexible and durable stainless steel jacket spring wire - a design that wouldn't disintegrate even under extreme conditions like bad weather, rough handling, etc. LITERALLY SUPER SPEED - Whether you want to charge your android, windows or another micro usb gadgets or transfer data between devices, poor speed could cripple you and affect your overall productivity levels negatively. However, the use of pure copper wire core enables operation at 2A current in our cable and thus allows you to charge your devices or transfer data at marginally higher speeds, reducing the charging time by up to 60% - unbeatable performance, isn't it? COMPATIBILITY CHECK - Usually housings of a cable would prevent it from being compatible with many devices. However, given the thoughtful design, our Microo USB cable is compatible with almost all ANDROID and WINDOWS devices - be it Samsung Galaxy S7/S7 Edge/S6/S6 Edge/Note, HTC One M9/M8/M7, Motorola Turbo/Moto X/Moto G/Moto E, Sony, LG etc. The metal braided design has heavy duty construction, and is almost unbreakable with reinforced military grade shielding, and even pet-proof! STYLISH DESIGN WITH STRAIN-RELIEF COLLARS - This incredible Micro USB Cable has a sleek & slim metallic design which looks as chic as your premium devices when compared to plastic, rubber or nylon cables. Moreover, the innovative strain-relief collars ensure that even if you insert & pull it out 10000 times or bend it, the collar and the cable joint wouldn't get slightest of fray. These unique features of our USB Micro Cable makes it the Best Micro USB cable. 100% RISK-FREE SATISFACTION WARRANTY - We also offer you 12 Months Risk-free satisfaction guarantee to let you buy with confidence; no questions asked. However, we are quite sure that you will be super impressed with the robust build of this USB to Micro USB cable, tangle-free design, premium metallic finish, 3.3 ft (1m) long length which is sufficient for a wide variety of uses, and its compatibility with all your devices. If you have any questions about this product by Zeceen, contact us by completing and submitting the form below. If you are looking for a specif part number, please include it with your message.